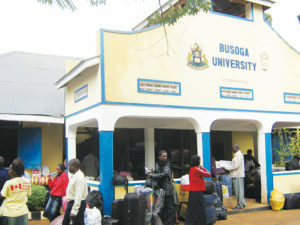 Busoga University reportedly awarded suspicious degrees to over 1,000 South Sudan and Nigeria nationals last year. File photo. The National Council for Higher Education (NCHE) has closed Iganga-based Busoga University citing unending irregularities at the institution. According to a General Notice No.1065 of 2017 published in the gazette, dated December 1, the university is not allowed to advertise or recruit any students henceforth. “Take notice that the National Council for Higher Education has revoked the provisional license of Busoga University and it has ceased to operate,” reads the notice addressed to the university Vice Chancellor. The notice further notes that the reasons for revocation of the provisional license are; absence of adequately qualified staff, admission of students without the requisite admission criteria, illegal affiliation, poor financial health and teaching of unaccredited programmes. Others are lack of up to date student records, failure to conduct progressive student assessment and irregular graduation of students who do not qualify. NCHE executive director, Prof John Opuda-Asibo, indicates in the notice that, the council shall set up a technical committee to work with the university to support their placement of eligible students to recognised higher institutions. The recent closure means that Busoga University can only reapply for a license to operate again after two years from the date of revocation (November 27, 2017), according to Section 98 (3) of the University and Other Tertiary Institutions Act. Busoga University troubles started last year when the Uganda National Council of Higher Education (NCHE) suspended its licence over the manner in which more than 1,000 South Sudanese were admitted and went on to graduate in a space of two months. The incident came to light after Lual Akol Nhial, the South Sudan education attaché, asked the body to review the admission of these students — most of whom are government officials and generals in the army — to analyse their continuous semester results, coursework and assignments and tuition fee payments of the past three years. It was later discovered that besides the South Sudanese, there are 50 Nigerian nationals involved in the scandal. In September, 2012, the same University was involved in almost a similar case, where it suspended four of its senior staff for issuing ‘fake’ degrees to students. The officials allegedly used to remove, from the graduation booklet, names of some students who were genuinely meant to graduate and substituted them with the unqualified ones, with the beneficiaries of the mischief reportedly having paid Shs60 million.